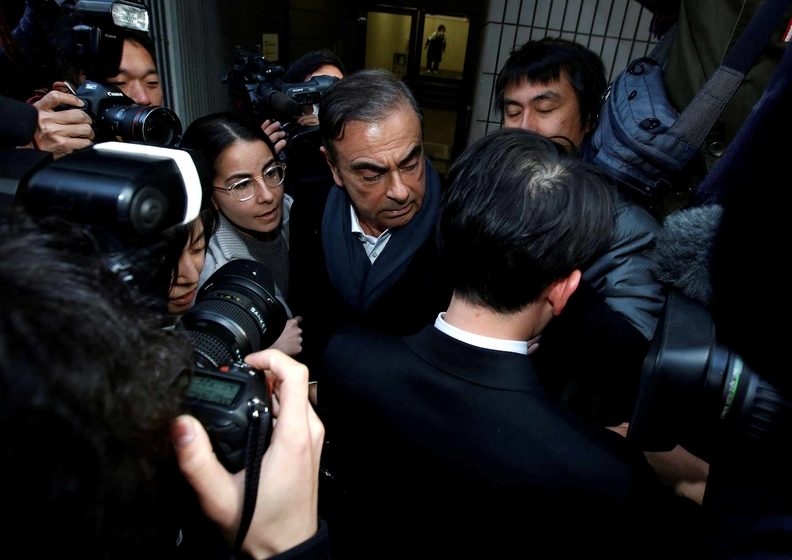 Former Nissan Chairman Carlos Ghosn leaves the office of his lawyer, Junichiro Hironaka, in Tokyo, on March 12. TOKYO -- Japanese prosecutors arrested Carlos Ghosn for a fourth time for alleged financial misconduct, following a raid early Thursday at his Tokyo residence in a move that escalates of the legal jeopardy facing the ousted auto executive as he awaits trial in Tokyo. Prosecutors charged him with breach of trust in the last development, saying that he caused financial damage to Nissan Motor Co. by misappropriating some $5 million for personal use. In their public filing, prosecutors said Ghosn arranged to have some $15 million transferred from a wholly-owned Nissan subsidiary to a bank of an overseas sales representative, from December 2015 through July 2018. Ghosn then received a portion of those funds for his personal use through a bank account of a third company where his wife works, prosecutors allege. Prosecutors said $5 million of the transfers were diverted to Ghosn’s personal use, and they allege the same amount of financial damage was incurred to Nissan. Ghosn has already been arrested on three previous charges, including one for breach of trust, and was free on bail awaiting trial on three indictments. It was unclear if the former chairman of Renault, Nissan and Mitsubishi was taken into custody following the latest charge. National broadcaster NHK said prosecutors were likely to detain Ghosn again. Ghosn was released on bail March 6, following his arrest on Nov. 19. He spent 108 days in detention. Prosecutors arrested Ghosn over a payment of to an Oman sales representative, some of which is suspected of being used to help pay for a yacht for his personal use, NHK and other Japanese media reported. Ghosn has denied any wrongdoing. In a statement released after his arrest Thursday, Ghosn vowed he “would not be broken” and said he may have to postpone his plans for an April 11 news conference. “My arrest this morning is outrageous and arbitrary,” Ghosn said. “It is part of another attempt by some individuals at Nissan to silence me by misleading the prosecutors. Why arrest me except to try to break me? I will not be broken,” he said. A team of officials entered Ghosn's residence around 5:50 am in Toyko and asked him to go voluntarily to the prosecutor’s office, the report said. Japanese media have reported that prosecutors were considering a new case against Ghosn, this time over payments Nissan allegedly made to a business partner in Oman. The new probe targets results of an internal Nissan investigation that found Ghosn approved payments of around $35 million from Nissan to a distributor in Oman between 2011-18. Japanese media reports said that Ghosn paid Suhail Bahwan Automobiles out of his CEO Reserve, a special fund for ad hoc expenses. The disbursements were marked as marketing expenses, but prosecutors suspect they were channeled into personal use for such things as the purchase of a yacht and a 3 billion yen ($26.9 million) personal loan to Ghosn. In a January jailhouse interview with Japan’s Nikkei, Ghosn said the CEO Reserve is “not a black box” and that other corporate officers signed off on the payments. Reuters reported earlier this week that Renault had alerted French prosecutors after uncovering suspect payments to a Renault-Nissan business partner in Oman while Ghosn was CEO of the French automaker. Ghosn attorney Junichiro Hironaka said the night before Ghosn’s latest arrest that he had not discussed the Oman allegations with Ghosn. But he said Ghosn might be re-arrested and detained again. “If the report proves to be true, Mr. Ghosn could be re-arrested and put into detention again,” Hironaka said. The lawyer cautioned that the court has already ruled that Ghosn poses no risk of flight or evidence tampering, as evidenced by its decision to grant bail. Thus, Hironaka said, it is difficult to see what argument prosecutors could make for detaining him on new charges. He faces up to 15 years in prison if found guilty. Nissan plans to hold an extraordinary shareholder meeting on April 8 to remove from the automaker's board Ghosn and Greg Kelly, the American director who was indicted as his alleged conspirator.